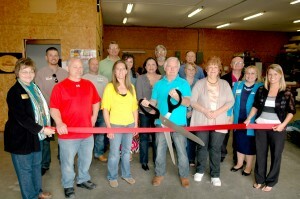 A ribbon cutting welcoming Jack's Upholstery to the Nixa Area Chamber of Commerce was held April 13, 2012 at 1754B N. Deffer Dr. The antique chair Kim covered for us is fantastic. Her workmanship is exceptional. We would be happy to recommend your shop to anyone. Thanks again for the great job. We visited Jack with a few requests for upholstery help and supplies. Jack went above and beyond to help us find what we needed. I would strongly recommend that if you have any need of upholstery work done that you visit Jack in Nixa. If you want a car's upholstery done by a True Wizard, choose Jack! Jack is a gifted artist at his trade. His prices are reasonable and he uses top quality materials. I just wanted to call and let you know what a nice job you did on the headliner in my husband's truck. We are very pleased. You were so nice on the phone, I knew I wanted to bring my cushions here. A design room for customers convenience. It is so nice coming to a place that feels like home, where the people are so friendly and helpful. I shopped around for new upholstery for my boat. I stopped at Jack's. The best customer service and the results were GREAT! A great group of people! I will go back in the future. out. Thank you so very much for the exceptional job you did on the seating. We could not be happier...impressed how great it looks. Are you ready or do you still have that ugly duckling? Jack, I wrote a review for the work you did on my boat. I'm not very computer savvy, and don't know if it worked. If there's an easier way, please let me know. And thanks again, the boat looks great!! !